Where can I watch a Derby United bout? All Derby United home events are held at their private facility at 6060Federal Blvd. San Diego, California 92114. You can view all of our confirmed games on our Events page or visit our Ticketleap page. Tickets will be sold on site when Gates Open, as long as we have not already sold out online. We accept cash and credit cards for ticket purchases at the door. Can I get a refund if I purchased a ticket and can’t attend the bout? No. Tickets are NON-REFUNDABLE. We are unable to process any refunds or credits for unused tickets. Priority bleacher setting is available when guests purchase a BLEACHER SEAT. We have one large, raised sets of bleachers at the perfect angle and location for you to see all of the action. We have two smaller sets of bleachers that also give fans a chance to sit and watch the game. General admission is standing-room only with some raised platforms and limited front row bench seating for our guests with limited mobility. With the banked track, it can sometimes be difficult to see all the action while standing. Arrive early to get the best spot! Are the bouts handicap accessible? Our facility is ADA accessible. Derby United welcomes fans of all abilities. There are ADA parking spots on site, as well as wheelchair, and companion seating. If you require ADA parking, please tell the event attendant and we will guide you to your priority parking. How old to I have to be to attend a bout? All ages are welcome at Derby United roller derby bouts. However, roller derby is a very exhilarating sport and the action and crowd may be overwhelming and loud for children under two. Earplugs or earphone covers are suggested for young children. Is there food at the bouts? Yes. The Derby United has a concessions stand that sells snacks and ice-cold drinks. NO OUTSIDE BEVERAGES ALLOWED – ANYONE WITH OUTSIDE BEVERAGES WILL BE ESCORTED OUT OF THE FACILITY AND WILL NOT BE ALLOWED RE-ENTRY! 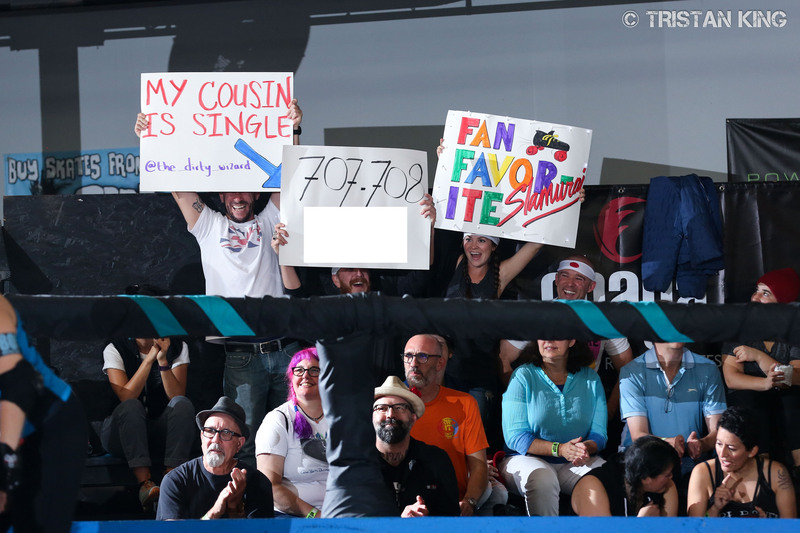 Can I buy merchandise at the bout? Yes, there will be merchandise and vendor booths, so you can purchase all your favorite Derby United attire. Will there be other entertainment too? Yes, most bouts also include announcers, prize giveaways, bout shouts, and halftime entertainment. Is roller derby for real? I heard it's fixed? Roller derby is for real and it is absolutely NOT fixed! When you attend one of our bouts, you’ll quickly learn that roller derby is a real sport with governing rules and trained athletes. Our players train tirelessly for this sport and we uphold and admire the athleticism of modern roller derby. Will I be able to follow the action if I don’t know how roller derby is played? Brush up on the rules of the game in advance and you’ll be sure to follow along on game day. We also have knowledgeable announcers to help keep fans up to speed on what is happening during each jam, and any penalties incurred. And there are always Derby United volunteers walking around with “Ask Me” tags at each bout specifically to talk “derby” with you. Brush up on your roller derby lingo with our glossary. I want to learn to play roller derby. How do I sign up? Check out information about all the programs Derby United has to offer on our training page. Please feel free to contact us directly and we’ll get your questions answered.